Robert Parker’s rating system employs a 50-100 point quality scale. It is my belief that the various twenty (20) point rating systems do not provide enough flexibility and often result in compressed and inflated wine ratings. THE WINE ADVOCATE takes a hard, very critical look at wine, since I would prefer to underestimate the wine’s quality than to overestimate it. The numerical ratings are utilized only to enhance and complement the thorough tasting notes, which are my primary means of communicating my judgements to you. 96-100 An outstanding wine of exceptional complexity and character. In short, these are terrific wines. 90-95 An outstanding wine of exceptional complexity and character. In short, these are terrific wines. 80-89 A barely above average to very good wine displaying various degrees of finesse and flavor as well as character with no noticeable flaws. 70-79 An average wine with little distinction except that it is soundly made. In essence, a straightforward, innocuous wine. 50-59 Wine deemed to be unacceptable. This amazing tasting was historic due to the fact that one was able to track 35 vintages of a wine from the same vineyard that, while the winemaking and upbringing changed dramatically in 1989, the identical people and vineyard were still in play. As John and Doug Shafer, along with their longtime assistant, Elias Fernandez, said, the major changes were that they were basically going through a learning stage in the late seventies and throughout the eighties. They attributed the hiring of Tony Soter in the late eighties with teaching them “how to make wines with our senses, not numbers” and stop sterile filtering and eventually end all filtration in 1989. Several of the older vintages have held up well, but one can see the sterile-filtered wines made with a safety net, and picked “by the numbers” throughout the eighties have not turned out to be the world-class Cabernet Sauvignons that are associated with Shafer today. From the early nineties on, especially starting around 1994, the quality of the wines soared to first-growth standards, and have remained there for the last twenty plus years. In fact, one can argue that no wine produced in the world over that twenty plus year period of time has scored as consistently highly as the Shafer Hillside Select Cabernet Sauvignon. Keep in mind, this is 100% Cabernet Sauvignon from their Stags Leap hillside vineyard that is aged 32 months in 100% new French oak, and from the early nineties on, most vintages have at least 25-50 years of aging potential. The Shafers, along with Elias Fernandez, who marked thirty years of working together in 2014, are among the great gentlemen of the wine world. They enthusiastically encourage visits to their estate just off the Silverado Trail in Stags Leap. No reader will regret visiting this estate. John Shafer, who is now 90 years of age, left a 23-year career in the publishing industry, moved to Napa Valley in 1972, and had the foresight/vision to purchase a 210-acre estate in Stags Leap. Some vineyards had been planted decades earlier, but all of those vines had to be pulled out and replanted. The first vintage came in in 1978. Doug Shafer joined his father after he graduated from college, and Elias Fernandez has been an integral part of this extraordinary team since he arrived thirty years ago. Like the 2012, the 2013 Cabernet Sauvignon Hillside Select will be more approachable in its youth than most Hillside Selects. It’s amazing how they seem to hide 100% new oak aging, and, of course, the wine spends 32 months in those barrels. Unbelievably rich with great focus, more blue and purple fruits seem to dominate and there’s a hint of white flowers and a focus that is nearly surreal. This is a layered wine, built like a skyscraper, a prodigious Cabernet of full-throttle intensity and purity. I can’t say enough about winemaking at this level, and how consistent Shafer has been for so many years. Look for the 2013 to have four or more decades of longevity as well. The 2012 Cabernet Sauvignon Hillside Select is not in bottle, but it looks like another three-digit wine in the making. It tips the scales at a lofty 15.3% natural alcohol, but tasters will never feel any “heat” tasting it. This is a beauty, with crème de cassis notes intermixed with spring flowers, a touch of toasty oak, blackberries, blueberries and cassis, as well as licorice, vanillin and a full-bodied mouthfeel. At this stage, it is more voluptuous and opulent than the 2010, simply because that’s the hallmark style of the 2012. No doubt this is a 30- to 50-year wine if you want to cellar it properly and nibble on it over a long period of time, but it will be much more approachable in its youth than most Hillside Selects tend to be. This is, once again, a fabulous effort. Possibly the Cabernet Sauvignon of the vintage is Shafer’s 2011 Cabernet Sauvignon Hillside Select. Last year I thought it was a strong effort, but it’s even better now that it’s been bottled. With an opaque black/purple color and notes of subtle burning charcoal embers, blueberry, blackberry and graphite, the wine has a certain Bordelais minerality, but then the richness of Napa kicks in. It’s full-bodied (somewhat unusual for a 2011) with lighter tannins, and no doubt the wine will be on a faster evolutionary track than vintages such as 2010, 2012 and 2013. Nevertheless, the Shafers and Elias said this was the toughest vintage they’d ever experienced. To be able to produce a compelling wine like this is a testament to their extraordinary skills and craftsmanship. This wine can be drunk now or cellared for another 15-20 years. A remarkable wine, the 2010 Shafer Cabernet Sauvignon Hillside Select has gone from strength to strength since it was in cask. It is stunningly rich, with classic, fragrant notes of blackcurrants, blackberries, vanilla, graphite and spring flowers. It exhibits an opaque purple color, with a full-bodied, massive mouthfeel, but no heaviness, and again, a flawless integration of acidity, tannin, alcohol and wood. It’s classic California Cabernet, but beautifully put together, showing impeccable craftsmanship and fabulous potential. This is obviously a very young, infantile style of Cabernet that won’t hit its prime for at least another decade and last close to half a century, based on how older vintages that were less well-endowed have matured from Shafer. The 2009 Shafer Cabernet Sauvignon Hillside Select is a more ordinarily constructed, compact effort from Shafer, but very powerful, with blackcurrants, cedar wood, vanillin and spice box. The wine is full-bodied, showing outstanding purity, a slightly more narrow framework and a linear personality. Nevertheless, it’s top-notch and a brilliant wine on its own. Vanilla, toast, blackcurrants, graphite, earth and foresty notes are all present in the 2008 Shafer Cabernet Sauvignon Hillside Select. It has great fruit, a medium to full-bodied mouthfeel, and quite a perfumed personality, but not quite the intensity and length of its predecessor. It could be one of those troublesome pairings where this just happened to follow an out-of-this-world compelling wine. The 2008 is certainly outstanding, just not one of the all-time greats. One of the perfect wines from Shafer is the 2007 Shafer Cabernet Sauvignon Hillside Select. Think it over – in the first decade of the 21st century, Shafer scored three perfect scores and two 99s – that’s about as high a praise as I can give any producer in the world. Opaque purple in color, the 2007 has a stunning nose of sweet crème de cassis, black cherries, licorice, and toasty oak, a multilayered, full-throttle personality, and a texture that builds and builds. Great purity, fabulous fruit intensity and a richness without heaviness characterize this massive, prodigious effort from Shafer. It’s still very young, despite this vintage, which seems to be maturing precociously. I don’t believe this wine will hit its stride for at least another 5-10 years and drink well for at least 2-3 decades. A slightly more compact version of the great Hillside, but nevertheless youthful, the 2006 Shafer Cabernet Sauvignon Hillside Select has a dense purple color, some notes of damp earth, cedar wood, forest floor, red and black currants, and toast. Some austere tannins kick in in the finish, but the wine is full-bodied, ripe and rich. An outstanding effort, but not one of the monumental vintages for Hillside Select, it should be drunk over the next 20 years. Like many 2005s (I’ll be doing a retrospective of this vintage in several months and look forward to it), this was a vintage that seemed to start off relatively uneventfully and was rather slow to reveal its true merit early in life. Like a thoroughbred race horse, it just seemed to get stronger and stronger in barrel, and now that the wines have been in bottle, they continue to strut their stuff. Of course, 2004 got much more publicity because of the heat, and after 2001 and 2002, there weren’t a lot of superlatives left to give, but 2005 has turned out to be a great vintage and the 2005 Shafer Cabernet Sauvignon Hillside Select is certainly one of the superstars of the vintage. Flirting with perfection, this wine is still youthful coming up on ten years of age. A wine of great intensity, it shows off a boatload of blackcurrant liqueur, charcoal and spring flowers, with hints of blackberry and blueberry for additional complexity. The wine has stunning richness and purity, a multidimensional, full-bodied mouthfeel, impeccable purity and that flawless integration of acidity, wood, tannin and alcohol that the Shafer’s and winemaker Elias Fernandez routinely achieve. This is a beauty for drinking now or over the next 30-plus years, although I think patience suggests holding onto it for further nuances to develop over the next 5-10 years. This vintage shocked me when I did my retrospective earlier this year, and the 2004 Shafer Cabernet Sauvignon Hillside Select acquitted itself brilliantly in the vertical of Hillside Selects. It was a hot year, a relatively early harvest and there were worries that the heat had stressed the grapes, and there would be a lack of physiological ripeness and nuance. Those worries have not manifested themselves in this great Cabernet Sauvignon. Inky/purple-colored with notes of blueberry, blackberry, cassis, spring flowers, and a touch of toast, the wine is opulent, voluptuous and full-bodied with sweet tannin, just enough acidity to provide freshness, vibrancy and delineation, and a spectacular finish that goes on 40+ seconds. This is a killer, a showy and flamboyant style of Hillside Select that’s already drinking beautifully and should continue to do so for another 15-20 years. The 2003 is a singular style of wine, but by no means wimpy or undernourished. The 2003 Shafer Cabernet Sauvignon Hillside Select has a dense, purple color, notes of creosote, graphite, blackberry and cassis fruit, charcoal and scorched earth. It has a full-bodied mouthfeel and excellent purity, while some rather noticeable tannins kick in on the finish. This wine seems to be moving from adolescence to that early mature stage, where I would expect it to hold for at least another 10-15 or more years. Clearly not one of the superstars in what was a rather astonishing qualitative lineup, but it’s outrageously good Cabernet Sauvignon, and I expect myself, as well as any of my readers, would drink this 24/7. In contrast to the more linear, structured, but massive 2001, the 2002 Shafer Cabernet Sauvignon Hillside Select is pure fruit-bomb material, but stunningly proportioned, beautifully pure, with notes of melted chocolate, blackcurrant jam, sweet black cherries, licorice, camphor and charcoal. Very full-bodied, like the 2001, but much more lavishly fruited, it is more accessible and hedonistically, as well as intellectually, satisfying. If the 2001 is the long-distance runner, this comes across more like a middle-distancer. It had performed fabulously well since it was released by the winery, and even though it’s still an adolescent in terms of its evolution, this wine is a head-turner in wine tastings, and a spectacular effort from Napa. Drink now or drink in 20-25 years. The 2001 Shafer Cabernet Sauvignon Hillside Select is the first of these back-to-back perfect wines from Shafer that, at age 13, is still a baby, but, wow, what an amazing wine. A fabulous growing season produced a wine with inky/purple black color, stunning crème de cassis notes, with additional hints of lead pencil shavings, spring flowers, cedar wood and forest floor. It is full-bodied, sensationally concentrated, with a seamless integration of acidity, tannin, wood and alcohol. This is a great, monumental Napa Cabernet Sauvignon that is still an infant, at age 13, going on 14. This has got at least three decades of life left in it, and probably won’t hit its peak for another 5-7 years. The 2000 Shafer Cabernet Sauvignon Hillside Select is another beautiful vintage from a challenging year. The brilliant winemaking and great terroir of the Hillside Select overcame the vintage deficiencies. A touch of herbaceousness is a rarity in a Hillside Select Cabernet Sauvignon, but one can taste it in the 2000. It adds complexity as opposed to any distraction. Somewhat similar in style to the 1993, with a certain austerity, but deep, tarry red and black currant fruit and plush medium to full-bodied texture, this wine seems to have reached full maturity, where is should be drunk up over the next 5-10 years. A vintage I was never as fond of as many of my colleagues, the 1999 Shafer Cabernet Sauvignon Hillside Select certainly proved that they may have been more correct. Certainly not one of the all-time Shafer Hillsides, but nevertheless, a youthful, tannic, firm, structured wine, with more intellectual than hedonistic appeal at age 16, this wine has a dense purple color to the rim, notes of licorice, tobacco leaf, blackcurrants, followed by relatively high acids for a Hillside Select (or at least they present themselves that way) with some rather massive tannin. This is a big, medium to full-bodied wine with a Bordeaux-like structure imposed on it. It’s still moving in the right direction, and should hit its peak in another 4-5 years and then last for 15-20. The 1998 Shafer Cabernet Sauvignon Hillside Select was produced during a challenging vintage in Napa Valley with an incredible heat wave in mid-July, with temperatures at the Hillside Select property hitting an astonishing 114 degrees. This was brutal for the grapes, but a strict selection, and as Doug and John Shafer said, “We make no excuses at this winery.” Certainly, this was one of the great successes in this vintage. Very tiny yields from small, rather shriveled berries produced a super-extracted, rich, intense wine that has some smokey barbecue notes along with blackcurrants, cedar wood, wet rocks and background oak and burning embers. There’s almost a Graves-like, scorched earth character to this vintage. This medium to full-bodied wine is intense and undeniably one of the top ten wines in Napa Valley. Moreover, it should continue to drink well for another 10-15 years. 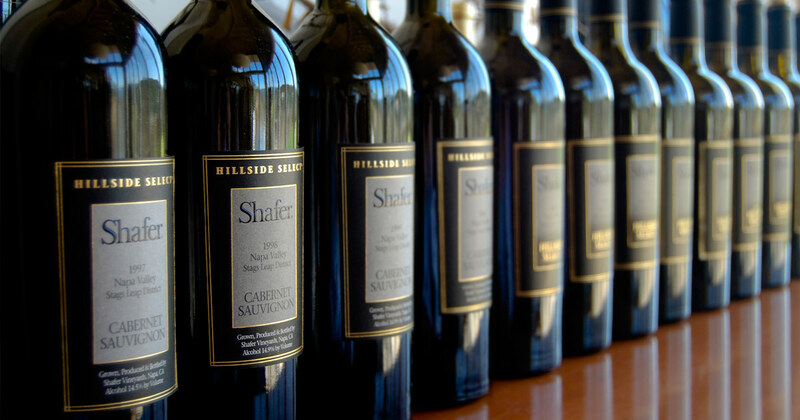 The 1997 Shafer Cabernet Sauvignon Hillside Select is a relatively evolved style for Hillside Select and seemingly more advanced than the older vintages, such as 1995 and 1994. Nevertheless, there is plenty to excite. It’s a big wine, dense purple in color with some lightening at the edge, plenty of crème de cassis fruit, lead pencil shavings, sweet vanilla and earth. It is very ripe, full-bodied, opulent and voluptuously textured. This is terrific stuff, hedonistic, showing secondary/tertiary nuances in the aromatics and essentially a full resolution of the tannin. This wine also seems to have come into its own and is clearly at its peak of flavor. Drink it over the next 10-15 years. A drought year produced the 1996 Shafer Cabernet Sauvignon Hillside Select, which is slightly more compact than great vintages, but nevertheless impressive. It offers further evidence that even in more challenging years, the Hillside Select is a special wine. Dense plum/purple with notes of cedarwood, charcoal, underbrush and forest, the wine has plenty of cassis, a medium to full-bodied mouthfeel, ripe tannin, but a slightly less impressive finish than the 1995 or 1994. This wine seems to be in its plateau of full maturity, where it should hold for at least another 10-12 years. A spectacular wine, the 1994 Shafer Cabernet Sauvignon Hillside Select begins a succession of profound Hillside Select cuvées that continues nearly uninterrupted (1996 misses slightly) to the present day. It is a further indication of just how impressive this team’s performance has been at this winery. The fully mature 1994, which has another 15-20 years of drinkability ahead of it, exhibits a complex, nearly flamboyant nose of subtle oak, blue, red and black fruits, graphite and licorice. The gorgeous aromas are followed by an opulent, full-bodied, multidimensional mouthfeel that coats the palate. The deep purple-colored 1993 Shafer Cabernet Sauvignon Hillside Select is somewhat disjointed on the palate. Although there are some attractive blue and black fruits in the nose, along with some new oak in the background, the bouquet reveals a lack of focus. This tough vintage has turned out an outstanding Hillside Select, but it is not one of the superstars of 1993. Medium-bodied and intact aromatically and flavor-wise, there is an overall sense that something is missing. The 1992 Shafer Cabernet Sauvignon Hillside Select is another killer wine boasting a dense purple color as well as a gorgeous bouquet of crème de cassis, creosote, camphor, licorice, blackberries and subtle background oak, and full-bodied, heady flavors. It is clear that after 1991, the Shafers and Elias Fernandez were entering a dramatic new level of quality as the Hillside Select cuvée had become a world-class effort. This beauty is just becoming fully drinkable and should continue to provide immense enjoyment over the next 20 years. The 1991 Shafer Cabernet Sauvignon Hillside Select represents the beginning of a new era where sterile filtration was halted, after which the quality of most vintages soared to new heights. They may also have been picking riper fruit, as Napa Valley was in the midst of enjoying some fabulous vintages in what would turn out to be a Golden Era for its wineries. The 1991 is the finest Hillside Select of the early 1990s, although the 1992, 1994, 1995, 1997 and 1998 are close in quality. A stunning nose of licorice, vanillin, unsmoked cigar tobacco, crème de cassis and cedarwood are present in this multilayered, full-bodied, opulent, super-concentrated wine. It still possesses an opaque ruby/purple color to the rim. At age 23, this beauty is just hitting its plateau of full maturity. Spicy, cedary, unsmoked cigar tobacco, blackcurrant, sweet cherry and vanillin notes are present in the 1990 Shafer Cabernet Sauvignon Hillside Select, along with loads of fruit, a monolithic, plump, rich, medium to full-bodied mouthfeel and a good finish. The first wine of a new era, the 1989 Shafer Cabernet Sauvignon Hillside Select is the finest produced since the debut vintage in 1978. It still reveals a deep ruby/plum/garnet color to the rim as well as notes of graphite, cedarwood, blackcurrants and forest floor. Medium-bodied with excellent richness, soft tannins and an authoritative finish, it was a revelation in a vintage I generally do not find appealing. Made from a challenging vintage in Napa Valley, the 1988 Shafer Cabernet Sauvignon Hillside Select offers notes of roasted coffee beans and earth, but little ripe fruit. The wine is beginning to show some fatigue and oxidative tendencies, so drink it up. Made during the period when Tony Soter arrived at Shafer and began to insist on making the wines by using their olfactory and palate more than harvesting grapes by numbers and looking for fixed formulas and specific total acids and pHs/alcohol levels, the 1987 Shafer Cabernet Sauvignon Hillside Select reveals attractive red and blackcurrant fruit, sweet cherry, loamy soil and a touch of toasty oak notes in a medium-bodied style. With gentle tannins and a lush finish, it is by no means a great Hillside Select, but it is very good. The 1986 Shafer Cabernet Sauvignon Hillside Select was the only wine that tasted somewhat fatigued and oxidized. Notes of old plums, figs and prunes are present in this 1986. Too much sterile filtration was clearly an issue with the 1985 Shafer Cabernet Sauvignon Hillside Select, which did not have the aromatics, textural dimensions or expansiveness of the later (and greater) Shafer Hillside Selects. Nevertheless, this is still an excellent wine with a deep ruby/plum/purple color, tart acids, spice box, tobacco leaf, red and blackcurrant and earthy characteristics. The acids will never subside, and as the baby fat continues to dissipate, this wine will become more and more angular. From a hot vintage, the dark plum/garnet-colored 1984 Shafer Cabernet Sauvignon Hillside Select had to be acidified significantly. All the baby fat has fallen away, leaving the acids to jut out. There are lots of spice box, red and blackcurrant, cherry and loamy soil notes, but the wine exhibits an unusual tart feeling that has kept it fresher than one might expect, albeit somewhat angular. A better wine than the 1982 that has held up with cellaring, the 1983 Shafer Cabernet Sauvignon Hillside Select exhibits a dark garnet color as well as dusty, loamy soil, old oak, coffee, redcurrant and plum fruit notes, plenty of spice and a subtle hint of herbs. The herbaceous, straightforward, pleasant 1982 Shafer Reserve Cabernet Sauvignon reveals dry, attenuated characteristics, a lean, austere mouthfeel, and notes of tobacco intermixed with vegetative undertones, red and blackcurrants, and a tight, clipped finish. It was made during the learning curve years, and it reflects that. The 1979 Shafer Cabernet Sauvignon reveals compact, slightly herbaceous notes and is a typical so-called “food” wine that was so popular at the time. There is nothing wrong with it, and it is certainly very good to excellent, but it lacks the wow factor. The first vintage, the 1978 Shafer Cabernet Sauvignon, has turned out to be one of the strongest wines made during the first decade of this vineyard. It comes across like a Pauillac-styled red with notes of cedarwood, loamy soil, blackcurrants, fruitcake and tobacco leaf. It could easily be mistaken for a second or third-growth wine from the Pauillac/St.-Julien border given its sweet tannin, spice box, and loads of medium to full-bodied fruit. For this debut vintage, some American oak was used in the wine’s upbringing (a practice that was terminated). *This wine is listed on eRobertParker.com as being a Hillside Select, though the name came into use with the 1983 vintage.